It would not be entirely inaccurate to say that the Eames Office Chairs of Charles and Ray, on the most part, were unintended. They were perhaps more the result of the endeavors of Herman Miller and their product strategy than that of the Eames Office. The most famous of the Eames Office Chair designs, the Alu Group Ribbed and Soft Pad chairs started life as a household range for use both indoors and out. It was only so many years later that the range would be adapted into the office chairs we know and love today. Herman Miller had released Eames chairs and tables meant for the workplace as early as the mid 50’s with adaptive bases for the plastic and wire series. But it wasn’t until into the 1960’s that they began to recognize the burgeoning requirement for quality stylish furniture specifically for the office. The value driven post war years were being replaced with a new-found affluence during a time of real economic boom. Herman Miller, along with other brands, were shrewd at recognizing the new marketplace potential and went about creating products to meet the demand. 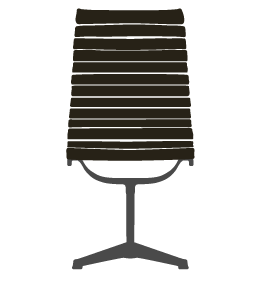 The adaptation of the Eames designs would be a stellar move as the chairs went on to almost define what an office chair should be and are still sold to this day. 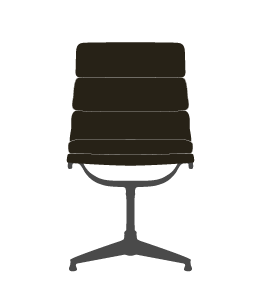 The first design to be adapted into an Eames office chair was the Time Life Chair from 1961. Originally a lounger specially designed for the lobby of the Time Life Building in New York, the desk chair version followed shortly afterwards when they were released to the general marketplace. 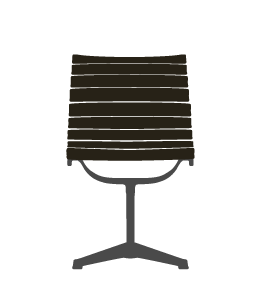 It was also the first to be issued on the Universal Base which could be fitted with either castors or floor glides. This base type would later adorn the entire Alu Group series and still does. The Time Life Desk Chair was a beautifully crafted design, made with plywood frame and aluminium supports and base, the chair was originally crafted only in leather upholstery although fabrics were introduced later. The 1958 released Alu Group were a series of chairs for the home consisting of a lounger, recliner as well as dining chair and even an ottoman stool. Its adaptation into a series of Office Chairs began in the mid 1960’s and coincided with the change of its pedestal base into the more versatile Universal type. There was a range of models in what would become known as ‘low back’ and ‘high back’ ribbed Alu Group Office Chairs. 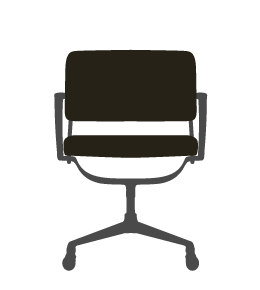 The Low Back office chairs were released with model numbers from EA105 to EA108 as a series of fixed or swivel meeting chairs, with or without arms. EA117 and EA118 were released as an executive top of the range version which also had a height adjustment and tilting mechanism. 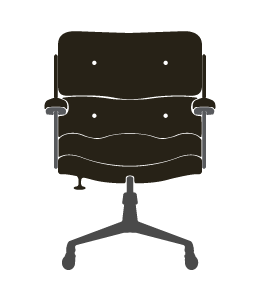 There were two high back models, the EA119 and EA120, both considered ‘management chairs’ with the full tilting and height mechanisms as standard. The model numbers only differed between the model with castors and that with glides. The 1968 Soft Pad group was basically an extension of the Alu group series from the decade before and adapted in the mid 60's. The same models, low back and high back, were released in the new range which had additional lumber and seat padding to the aluminium frame. Otherwise they were the same in all other ways including the type of models available. Both the Soft Pad Series and the original Alu Group ribbed chairs have remained in continuous production ever since and their classy, stylish design has never grown old and they remain favorites to this day. 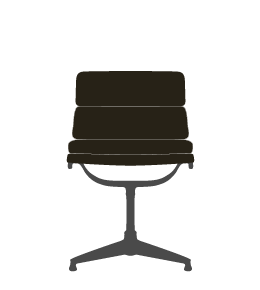 There was one other Eames office chair designed by Charles, the Intermediate Chair. It was believed to be an earlier prototype of the Soft Pad series and a favorite piece of Charles (who used one in his own office). The design was unusual and not like any of the other chairs, with a flattened, more horizontal design but retaining the soft cushioning and mechanisms for efficient desktop use.